Chats are piquantly spiced snack dishes laced with lime juice prepared with readily available ingredients. 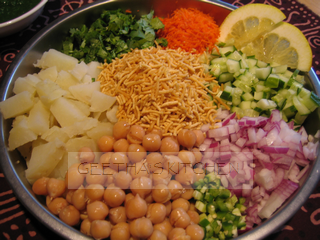 Aloo Chana Chat (Ah-loo Chanah Chah-t) is more than a simple snack of seasoned potatoes and chick peas. It is based on the ubiquitous snacks offered by snack vendors all over India. With the protein- and fiber-rich chick peas or garbanzos, crisp veggies, crunchy sev, and a sweet and sour dressing made with chutneys, it can double as a filling and nutritious meal. Served with a side of cooling plain Yogurt or the yogurt based beverage Lassi, it makes a delicious no-cook repast especially during summertime. 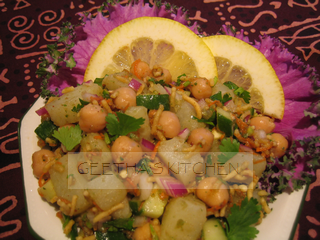 I used sprouted chick peas here but un-sprouted or canned may be used as well. The chutneys can be homemade or store-bought. Other crisp fresh veggies and fresh or steamed sprouts may be added. This is a basic blueprint recipe and you are welcome to vary the ingredients and their amounts as you wish. Sprinkle more chilies or ground hot red pepper (cayenne) on individual servings if you like it spicy. Chat Masala is a handy spice-mix great for sprinkling on baked regular and sweet potatoes, corn on the cob, sliced fruit, salads, etc. Sev is a ready to eat snack made of garbanzo flour and spices in the shape of thick/thin noodles. All of these ingredients including the chutneys are readily available at Indian markets. Prepare freshly cooked chick peas or garbanzos; if using canned, drain and rinse well. Peel the potato while still warm; chop into small cubes. Combine all the veggies and chick peas in a large bowl. Mix the chutneys with the lime/lemon and chat masala. 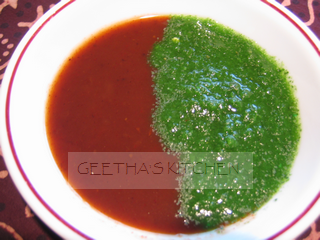 Drizzle the chutney mixture on top of veggies and mix well. Mix in the sev just before serving. Serve immediately. Aloo Chat should be eaten right away so the sev does not get soggy. Enjoy! !